I'm tempted to tell you it's because I've been far too busy living a glamorous high flying lifestyle but it's not. Partly I've had nothing to say and partly I've not cared to do anything but sleep, eat and cuddle dogs. Christmas came and went in a trickle of black and white films (for the past five years or so every Christmas Eve my family has gone to see It's A Wonderful Life on the cinema), long walks, food, and warmth. We didn't even have a Christmas tree this year, we just brought a vaguely triangular plant in from the garden and put a few baubles on it. My Dad and sister walking the dogs whilst I skipped around with the camera avoiding puddles. New Year involved an overnight to Sheffield to spend time with my lovely boyfriend who was busy revising for exams. I think I was asleep by 11 (more romantic than it sounds, I assure you). The second day of 2014 brought drama and chaos. Our beloved dog Lily was pregnant, and by now overdue; the vet told us to bring her in for a quick check, performed a few tests and told us she needed a c-section to get the puppies out. Here she is, ready to pop. Septuplets! She had one and then five more and then another one. 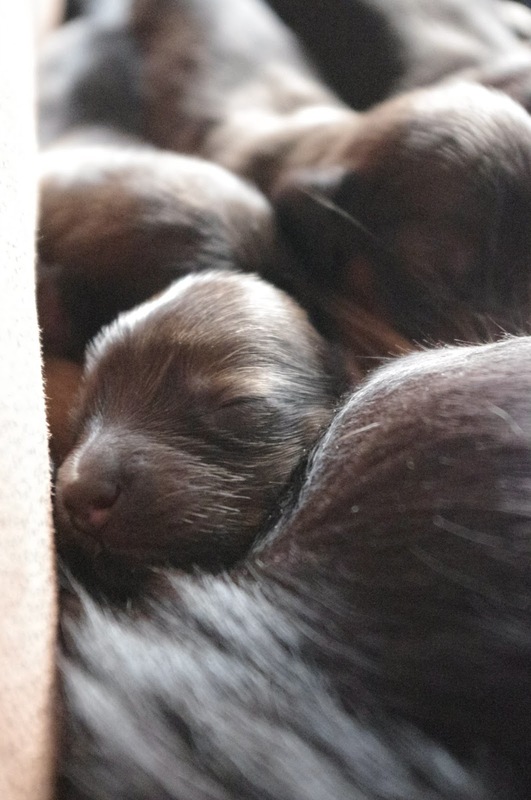 Her last litter was of four and that's a good size litter for a mini sausage dog; it's not unheard of for them to have 8 or 9 but it's very unusual and generally not all of them survive so we won't be contacting the Guinness World Record people just yet but we're still very impressed with how she did. There will be a full post on the puppies soon, but this one is about Lily. Here she is on the way to the vets, contemplating how children may change her life. Probably. A c-section is major abdominal surgery so the vet had told us she would be sore and tired, to not expect or allow her to move around too much at first so we didn't. The first night she was home with the puppies though she was very quiet and wasn't nursing properly so my mum and I stayed up again feeding them puppy milk formula and hoping all Lily needed was a good night's sleep. Unfortunately the next morning it was obvious something wasn't right, minutes after we said we'd wait for the vet surgery to open and take her round for an examination she stood up and her stitches ruptured. It was not pretty and it was not something I was going to stop to take a picture of, basically her insides ended up outside. I flew across the living room and screamed for my mum (screaming for your mother is a completely rational reaction to things that make your blood run cold); Lily was in the car and was speeding down the street before you could blink. My job was puppy guardian and ring the vets to say there is an emergency on its way, get ready. A few hours later we received another call to tell us to come back to the surgery and bring the puppies for a once over. They didn't say over the phone how it went, or even if we'd be able to take Lily home with us that night, so the drive round was very quiet as we all contemplated the worst. When we got there the surgery was very busy (almost as if their entire day had been forced off schedule by some kind of early morning emergency...) and the cardboard box I was holding soon attracted attention for the squeaks it was giving off. Once one person had asked to see what was inside, everyone wanted to have a look and ask What are they? How old are they? How many? Where's mum, is she alright? Eventually though our name was called and we were given the good news that Lily was fine. She's been allergic to the material used in her stitches and that's why she had been in pain and they'd given way, the vet had removed all the old stitches cleaned everything up and given her new ones in a different material. Apparently it is almost unheard of for dogs to have the kind of reaction she did, so don't worry about it being a major risk with any of your pets. The difference was like night and day, when they brought her through from the recovery room she was bouncy, wagging her tail and essentially herself again. She started trying to wriggle her way out of the vets arms as soon as she spotted my mum and then she wanted to dive in the puppy box when she heard the squeaking. I like your writing. What a Xmas even you had with your lovely doggy! Waiting for more pictures of puppies. And yes, be braver with your photography! They're coming! I've just taken so many since they've been born (and more every day) that I need to go through and pick the best ones to share.